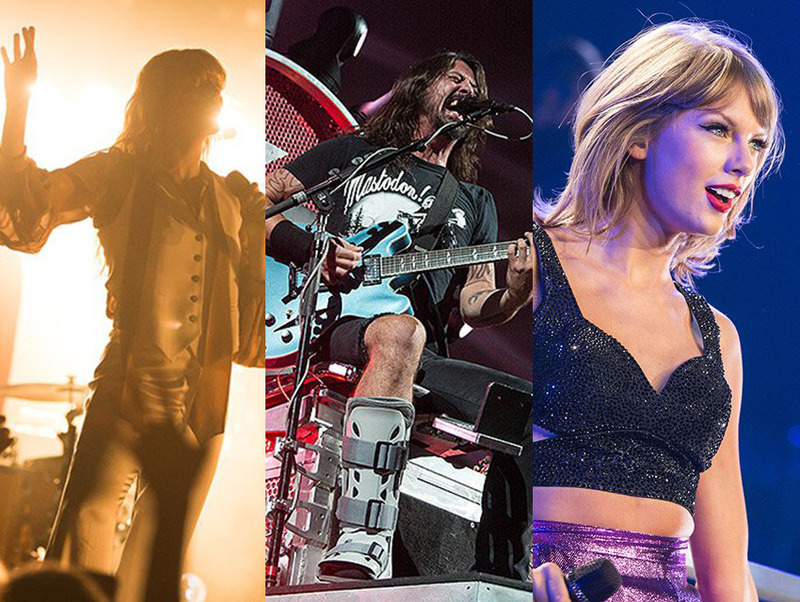 When it comes to live shows, 2015 was a year of broken feet, visual spectacles, and celebrity cameos. And it was spectacular. As always, we present our top picks chronologically to avoid the unfair and wildly subjective task of ranking a variety of acts, some of whom have nothing in common except the fact that they blew our minds. There were a few blissful moments at Coachella—St. Vincent’s wonky guitar solos, AC/DC’s incendiary set, the moment the Drake/Madonna kiss was over—but Tame Impala took the cake. The Australian psychedelic project helmed by Kevin Parker wasn’t even the top-billed headliner, but they sounded better than ever during their set in the desert, teasing tracks from their latest and most successful release, Currents. Even after killer performances from other headliners, Tame Impala was who we were talking about when the dust—literal and figurative—settled Monday morning. A chance to sing along to “Don’t Look Back in Anger” and “Champagne Supernova” would’ve been enough to put Noel Gallagher on this list, but the former Oasis man also has a solo catalogue that stands nicely on its own. It feels like a bit of a cop out to place legendary bands on best-of lists: They can afford production value that wows, they have catalogues brimming with iconic tracks, and they’ve been around long enough to hone their skills as entertainers. Even so, no one upended expectations this year quite like U2, whose string of shows at the Forum were an audiovisual masterpiece. On top of a set list full of hits, the band moved through parallel LCD screens along the catwalk, live-streamed themselves on an audience member’s phone, and gave a moving tribute to their late tour manager Dennis Sheehan. Ignore what we just said about legends being a cop out—Robert Plant was worth it. Not solely because of his status as rock’s golden god, but because the former Led Zeppelin frontman reinterprets his classics every time he tours. With a voice that still holds its power beautifully, Plant combines the joy of hearing your favorite decades-old song and simultaneously experiencing something you’ve never quite heard before. It’s a vital quality that keeps Plant’s shows from feeling like a trip through a rock and roll museum and his newer tracks from taking second stage. Masterful guitarist Joe Bonamassa covered “The Three Kings” of the blues—Albert King, B.B. King, and Freddie King—on his most recent tour, and it was a triumph. Bonamassa opened for B.B. King when he was just 11 years old, and the elder bluesman became his mentor. The fact that this show took place in the wake of B.B. King’s death made it even more poignant. Dave Grohl with a broken leg is like a kid pretending not to be sick because he’s supposed to go to Disneyland today. Grohl propped up his leg and glided down the catwalk on a throne of guitars (complete with a cup holder sized for a bottle of champagne), playing with just as much gusto as he would if he were on his feet. Twenty years into their career, Foo Fighters are as healthy as ever. FFS, the joint project of Franz Ferdinand + Sparks, is one of the most natural collaborations possible within music today—and the impetus was a broken tooth—but they can admittedly be an acquired taste to those unfamiliar with their respective careers. Their live show, though, turned out to be one of the most entertaining tours of the year, thanks to the theatrical stage presence of Alex Kapranos (Franz Ferdinand) and Russell Mael (Sparks) while delivering FFS’ intelligent, tongue-in-cheek lyrics. Here’s to hoping this collaboration wasn’t a one-off. Following in the (hobbling) footsteps of Dave Grohl, Florence Welch also spent time this year recovering from the fracture in her foot after a wild leap went awry at Coachella, though her dedicated showmanship means you’d never have known it during the show. By the time her tour for new album How Big, How Blue, How Beautiful hit the Bowl, Flo was back in top form, sprinting and skipping across the stage and into the audience, rock’s best whirling dervish since Stevie Nicks. Fleet Fox drummer Josh Tillman is a brilliant, if a little unlikely, folkster. He has already released a number of beautifully melancholic albums under his own name, but as Father John Misty, Tillman has found the perfect outlet for his darkly humorous subconscious. Performing against a neon backdrop that read “No Photographs,” Tillman mocked the crowd’s tendency to watch the show through their smartphones, asking the band to start a song over so a woman near the front could get the perfect shot. “There, it’s just like you were almost here,” he said with a laugh. Ok, we give up. T-Swift can rock. Her five-night stand at Staples was a who’s who of entertainment elite: Ellen DeGeneres, Justin Timberlake, St. Vincent, Beck, Kobe, Matt LeBlanc (yes, Joey from Friends), Orange is the New Black’s Uzo Aduba, Mary J. Blige, Alanis Morissette (who Swift’s fans probably thought was the older sister of her opener, Haim), John Legend, and more. It was good fun, but Swift doesn’t need a parade of A-listers to make her show entertaining—a well-written song has always won the day for Tay. Even Ryan Adams paid homage to 1989’s tracks this year with a full cover album (have you heard his killer rendition of “Style”? If not, Merry Christmas to you). The U.K.’s crown princes of rock can call Jimmy Page, Paul McCartney, and Dave Grohl friends, and it’s easy to see why. The duo of bassist Mike Kerr and drummer Ben Thatcher unearth a ferocious sound live that pays homage to the likes of Black Sabbath and Nirvana, expertly performed with the purity of one bass guitar and a drum kit. Puscifer, the other band of Tool’s Maynard James Keenan, is too difficult to label. But don’t call them a side project. The group pushes the boundaries of live performance, and such was the case with their show at the Ace, which consisted of a wrestling ring, luchadores, recorded messages, comedy, and the haunting harmonies and angular rock stylings we have come to know from Keenan. Muse conquered two nights at the Staples Center in the round, a format that made every fan in the room feel like they were playing just for them. Taking little time out for stage banter, Matt Bellamy & Co. treated the crowd to an expansive set list, curating a blend of tracks that was more prescient than nostalgic. Akin to the spectacle of a Roger Waters performance, Muse utilizes a visual motif of holograms, drones, lighting, and strobes that makes the audience feel a part of the narrative even as they’re singing along to their favorite tracks. There’s something special about seeing Jenny Lewis at Pappy & Harriet’s out near Joshua Tree. Lewis is already someone who makes you feel like you’re at a party in a Laurel Canyon backyard, so seeing her in a casual atmosphere (sipping her own Voyager wine from the bottle on a breezy desert night under the stars) can’t be topped. When we heard Grouplove’s frontman Christian Zucconi was playing the Echoplex with his pre-GL group ALOKE, we had to check it out. What we saw was an earnest set full of dreamy, dissonant soundscapes a la Pixies, Nirvana, and the trademark vocals of one of rock’s most energetic performers. When Laura Marling played the Palace Theatre this summer in support of her newest release, Short Movie, she showcased a harder, more electric side of her expressive, incisive folk music. Throw in her vastly underrated fretwork on the guitar, and the entire room was visibly enthralled from the first moment to the last. Mumford & Sons ditched the banjos and tweed vests for their third album, Wilder Mind, and brought their electric guitars and leather jackets to the Forum this summer. Despite fans’ apprehension before the album was released, the transition to electric worked for the British four-piece, allowing their passionate live performance to pack a little more punch. Rolling Stones at the Fonda performing Sticky Fingers in its entirety, Jeff Lynne’s ELO at the Fonda because ELO, and Jonathan Wilson’s 4th Annual Merry Minstrel Circus and Holiday Jamathon, which featured a surprise appearance from Tom Petty and the Heartbreakers.